Hello there everyone! 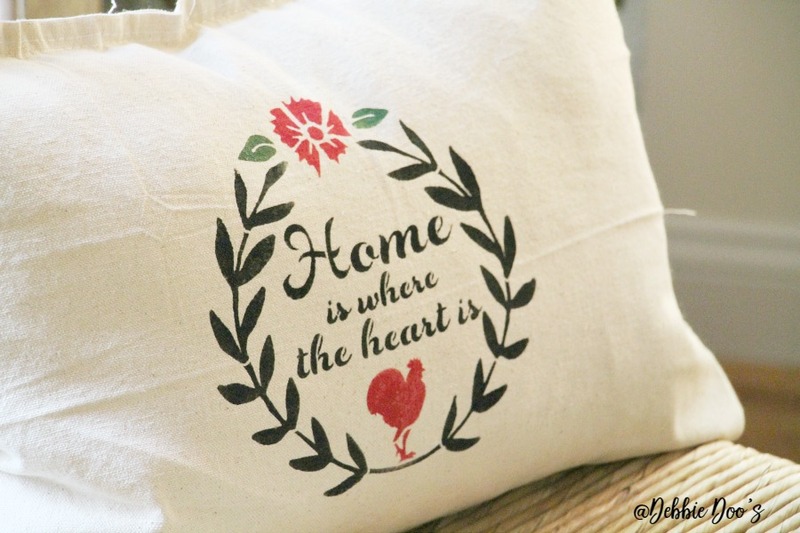 Today, I am sharing a no-sew drop cloth pillow tutorial. That a fiasco this little pillow here was. Actually, I have made three this week. I went on a Facebook live to share the tutorial and I really blew it. I was so distracted mostly with myself. I wanted to be able to keep up with the comments and say hello to the ones joining in. Well, that was my first mistake. Apparently, I can’t talk, stencil and hot glue all at the same time. Anyhoot, I wasn’t going to let it get me down. In fact, I laughed it off pretty quickly and jumped on the next day to do a re-take. Re-take successful. I love working with drop cloths. They are so inexpensive and durable. 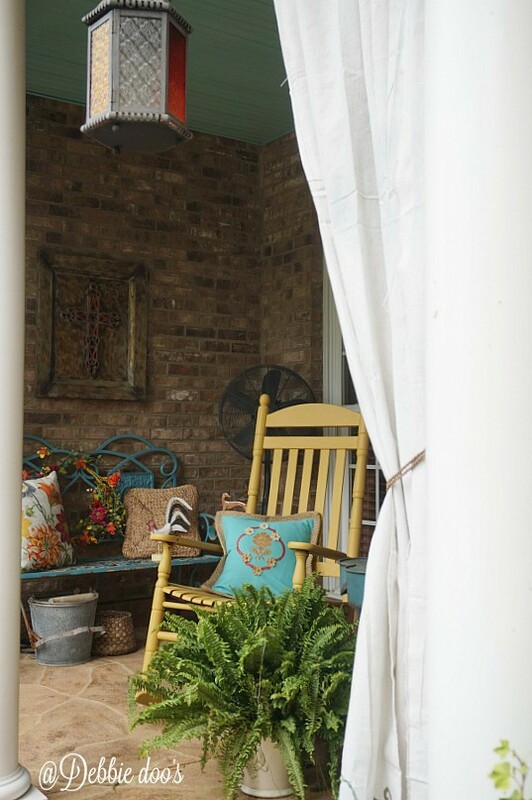 Remember when I made my drop cloth curtains for the porch? I have to be honest though, my husband hated them. He let me keep them up for a few months and then found some lame excuse as to why they had to come down. Suddenly he turned into Mr. Clean and wanted to remove the cob webs and paint the gutters. So not his thing, but he found any excuse to have to get them down. Not sure why he disliked them so bad. I am thinking maybe he thought they looked to feminine. Whatevs, I enjoyed them for the time being. He does however like the pillows I have been making. 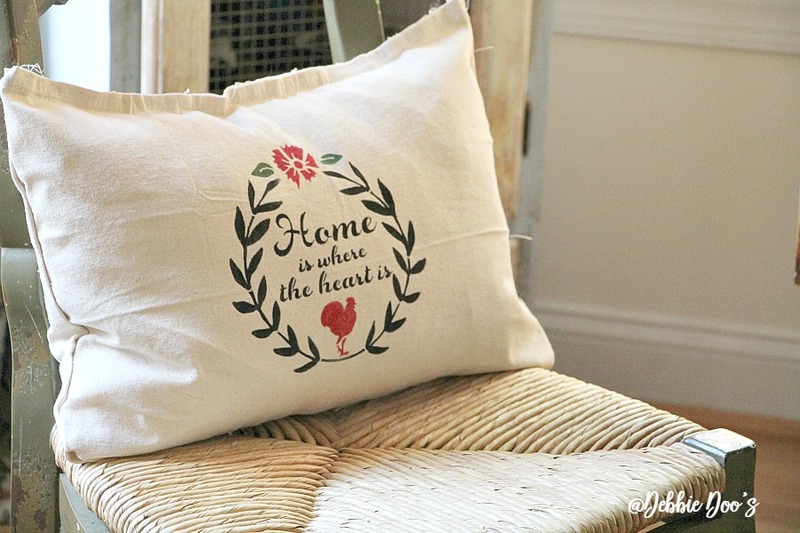 My new Home is where the heart stencil turned out perfect on this no-sew drop cloth pillow. The colors can be to your own liking to compliment your decor. Or if you are making as a gift, make it a universal all black, white, or red. 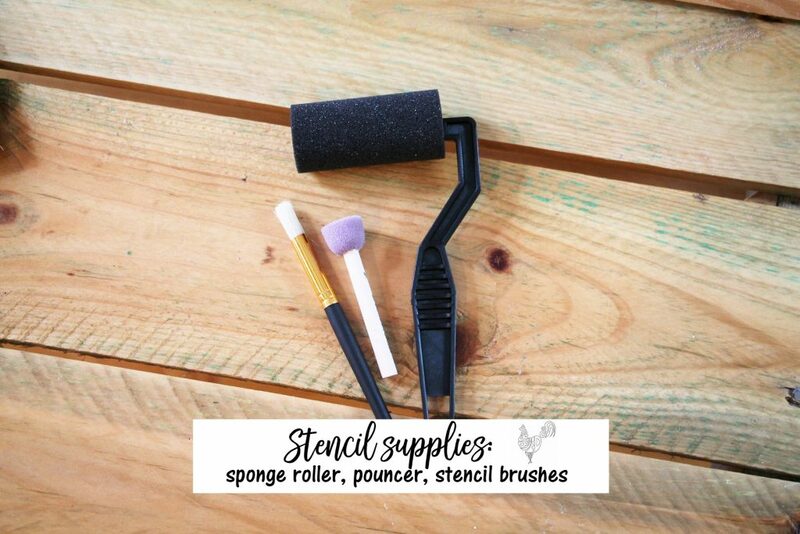 When stenciling with one solid color I prefer to use the foam roller brushes specifically for stenciling. When you are doing a little more tedious and switching the colors, then the bristle brushes are the best option when stenciling. I would avoid the sponge dabbers if I were you. Too many people make mistakes with those and get frustrated with their stencil work. They tend to bleed through and make it look sloppy. 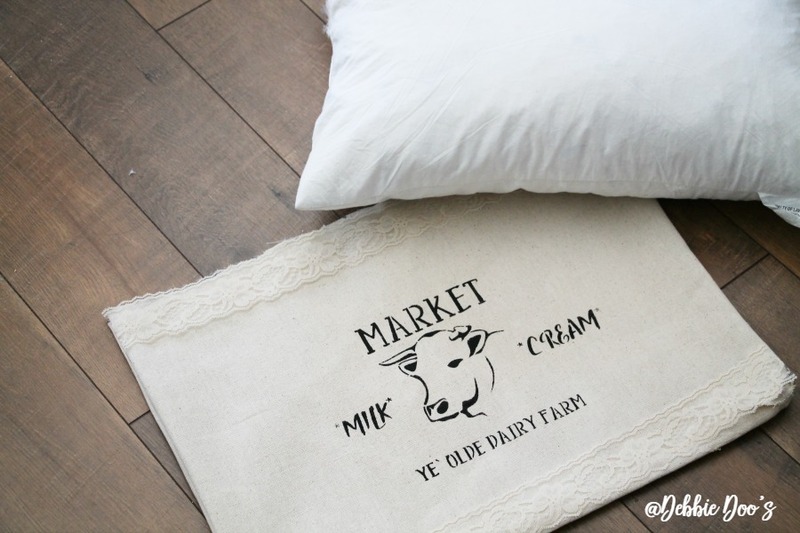 The market cow stencil got a touch a lace around the pillow. You can use any ribbon or trim that you prefer. All using a hot glue gun, or the no sew options such as peel n-stick, or liquid stitch works well too. You need to pull out the iron though when using those products. The one below is the pillow I botched up. It was easy to fix. 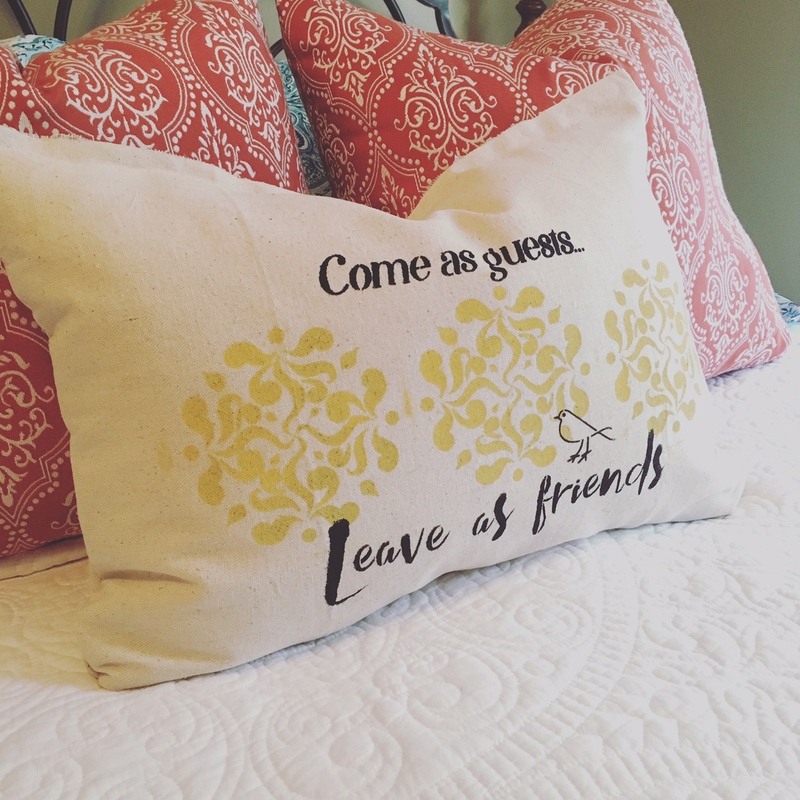 What I did was forget to flip the fabric face down (the stenciled part of the pillow). I started to hot glue all the ends and then when I went to turn it inside out is when I had the UH OH moment. Not only did I mess that up, the paint was still a tad damp. I explain here in my video how I made this. It really is quite simple and I guarantee you will be whipping out a few yourself in no time. Also, if you are looking for that perfect gift for under $20.00 this year for that special lady, or perhaps even yourself…here you go. 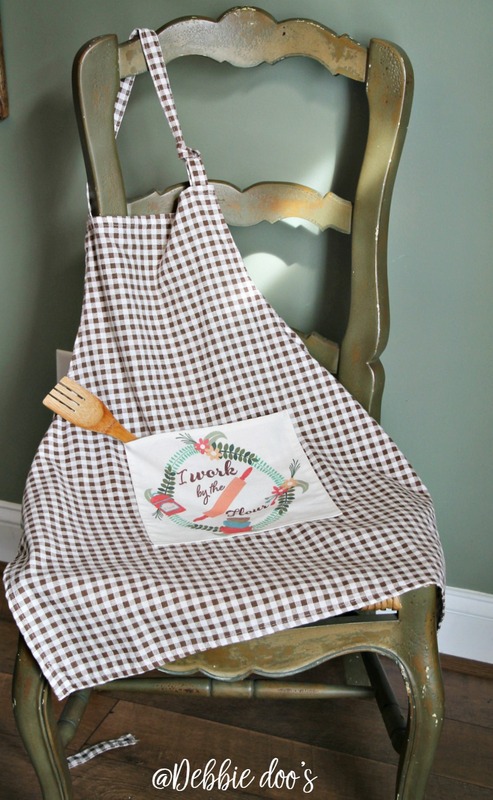 Our custom made homespun apron, with “I work by the flour” logo. 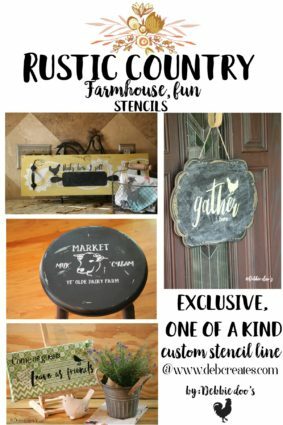 Gorgeous and your stencils are all so pretty. 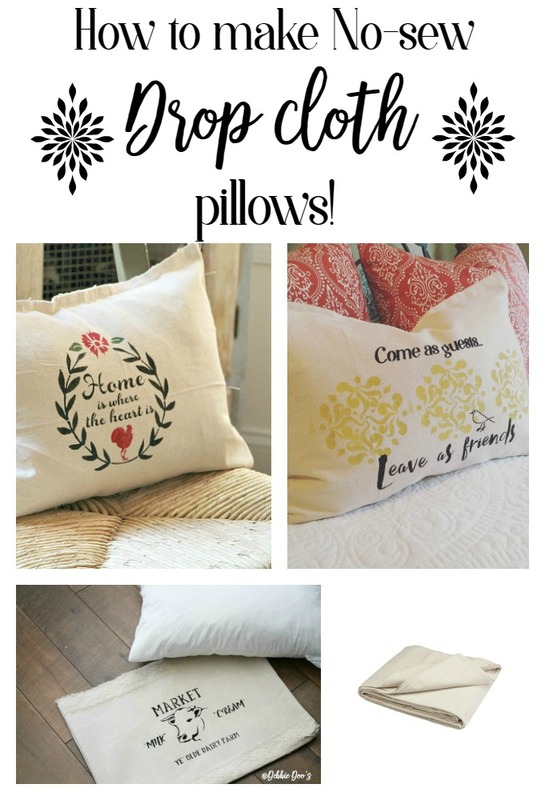 Those pillows are so cute and I love that they are no sew! Aren’t husbands funny sometimes? Mine does things like that too LOL! 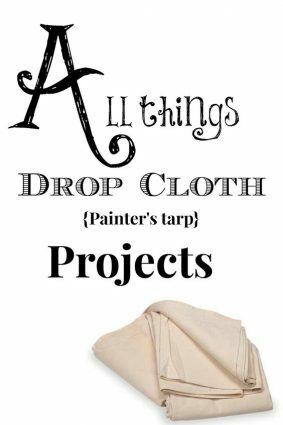 Dropcloths make an inexpensive fabric for projects…your pillows are charming! Debbie, fun post! Enjoyed reading about your goofs b/c good grief, we can’t be perfect all the time! I know I couldn’t “talk, stencil, and hot glue at the same time”! Your pillows are beautiful! Drop cloth material is already so homespun-y looking that it’s perfect with the farmhouse look that is so popular. You nailed it! Your apron is adorable too.